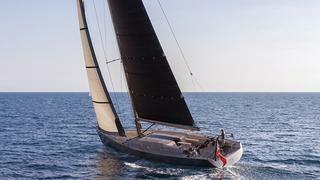 News just in from Y.CO that they have listed for sale the 24 metre sailing yacht OS. Built by Wally Yachts in carbon fibre to a design by the in-house team working with Farr Yacht Design, OS was delivered in 2004 as a fast cruising sloop developed for both cruising and racing. High performance comes courtesy of a High Modulus carbon fibre mast and boom and she carries sails supplied by North Sails. Harken deck hardware is used throughout. The interior was designed by Lazzarini & Pickering Architects and features a wide skylight that floods the full beam saloon with natural daylight. Up to eight guests are accommodated in three cabins consisting of a master suite with a king sized bed, a double stateroom and a twin plus two Pullman berths. All staterooms have en suite shower facilities and there are berths for two crew. Under power, a 250hp Cummins engine gives OS a cruising speed of 10 knots and she is asking €2.3 million.